Bright dry day so the Lowlight gets a work-out. Rather than buy the far from easy to find grey gear lever and handbrake boots I've used a spray colour dye. I fitted Luis Jimenez's beautiful reproduction 8 piece mat set to my '58 Coupe this afternoon. They are beautiful. Size and shape of OE insulation hand brake aperture. Size and shape of OE insulation gear lever aperture. Here's a picture of the original fibre and bitumen tunnel insulation on my '58. It's in 2 pieces front is 67cm long x 5mm thick and overlaps the rear insulation which is 63cm long x 2mm thick. The reason why the rear piece is thinner is because of the close proximity of the driver and passenger seats. Took a short drive to the local church where they had set up a cascade of Poppies as a tribute to the fallen. Nice bright day for a drive. Took my '58 Coupe along with "Wyatt Earp's" '65 Coupe on a photographic outing around the backroads of Hampshire. A quiet country lane in southern Hampshire and small rural church. The close viewpoint gives the Ghia a nose heavy shape...still looks good though. Exciting day for me today. After being the solitary Karmann Ghia owner in our village for 11 years, Nick joins me with his beautiful 1965 Karmann Ghia Coupe. My '58 at the historic West Gate through which Henry V army marched to the ships for Agincourt in 1415 and the Pilgrim Fathers embarked from West Quay on "the Mayflower" on August 15th, 1620. All Ghias prior to Aug 1957 came fitted with the Euro Spec bumpers without the "towel rail" bumper guards. After that US spec bumpers were standard fitting to Ghia destined for the US and an option on other Ghias. A few of us flying the VW flag at a local all-makes car show. 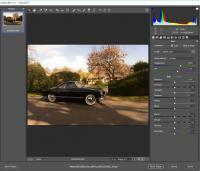 My '58 Karmann Ghia Coupe - Lymington, Hampshire UK. My usual trick of driving past the signs that say "No Cars Beyond This Point". Shamelessly stolen from FB. 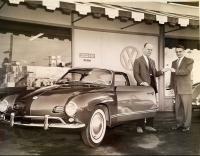 Text says, Richard Fromm receiving the keys to his first KG convertible from Veale VW. 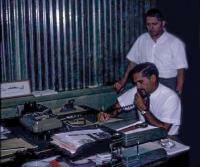 Richard was renowned local architect in Santa Rosa CA. Judson Electronic Magneto assembly line. Picture courtesy of Jesse Judson-Roth. The two Judson Brothers...W Haddon Judson snr. (standing) and Charles A. Judson (seated) in the Judson HQ office.